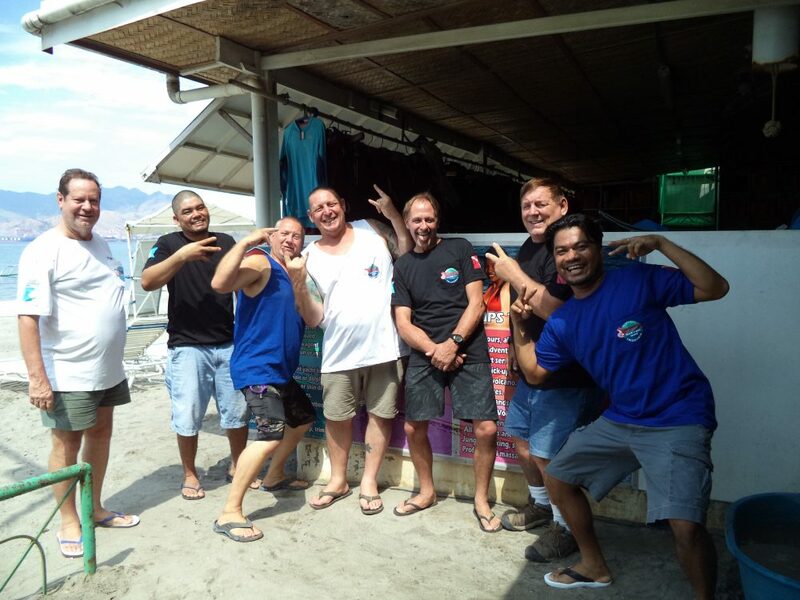 We can teach you right here in the convenience of our dive resort and develop your diving skills in Subic Bay to complete your course. 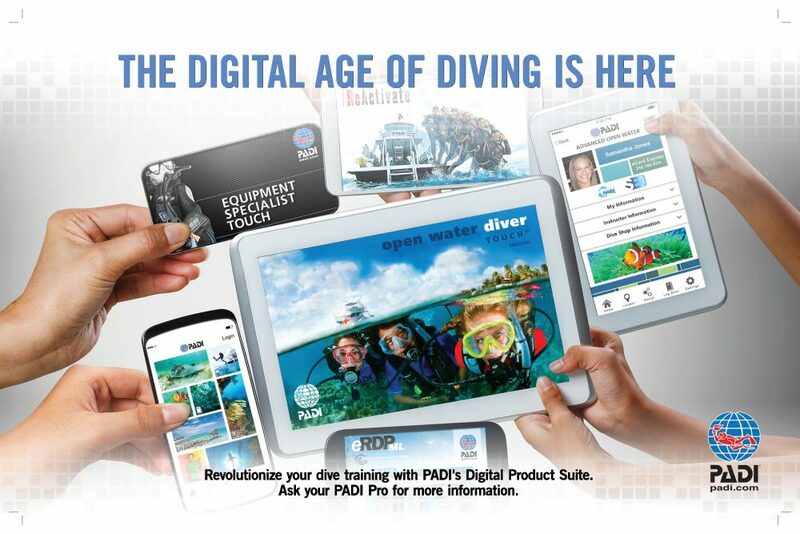 You can hold your worldwide accepted divers certification in your hand, sooner than you have ever imagined. Help us to protect the underwater environment. Instruction at our beach, only steps away from the dive shop. There’s a magical place waiting for you to discover, almost everybody can learn to dive and continuing his/hers diver education. Fun, educational, nitrox, wreck, deep, technical and trimix diving. 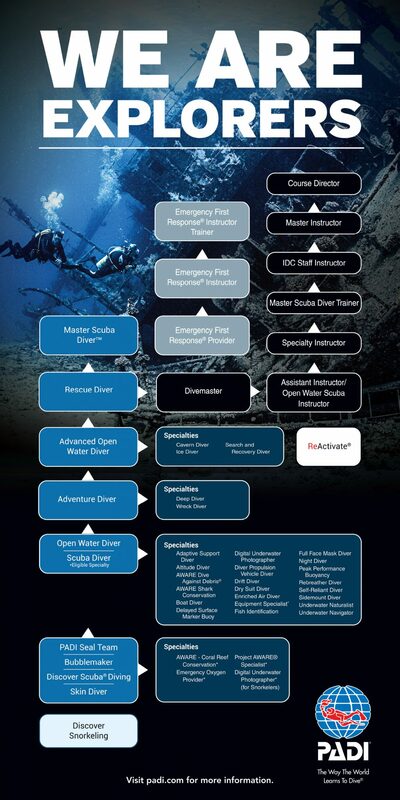 DIVERS: Let dive or teach you that extra specialty you still want to learn. 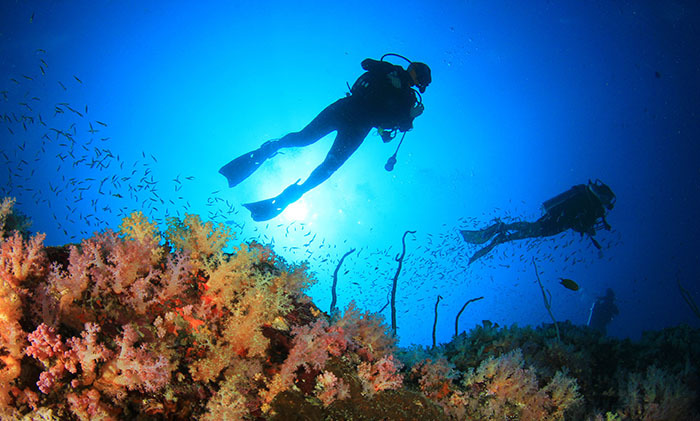 EXPERIENCED DIVERS: Let’s go adventure diving according to your wishes. Full equipment rental with air, nitrox, oxygen, trimix & rebreather refill for our customers. Full equipment sales and maintenance by professional technicians. Coral diving: more than 20 sites. Wreck diving: on more than 30 wrecks, battle cruisers, cargo ships, patrol boats, landing ships, antique steam ships, submarines, structures and airplanes. Three full time instructors with combined over 45 years of diving instruction worldwide. All scuba courses do not include equipment except the entry level diver courses. 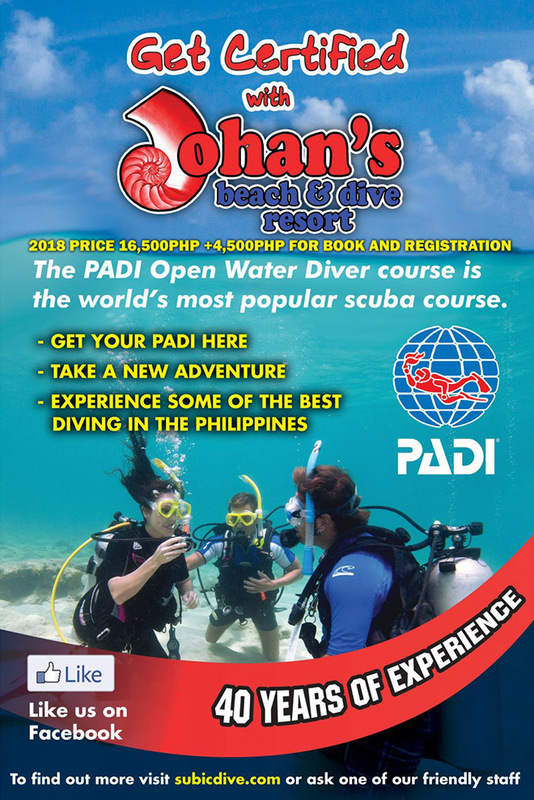 ( Snorkel, Skin diver, Discover scuba diving, Scuba diver, Open water diver) If you do not have your own gear, Equipment rental is P500.00 per dive or two main tanks (technical diving) P1000.00. The books have inclusive the on line PADI worldwide licence. If you want to do the academic section beforehand to save time than E-Learning is also available at certain courses. 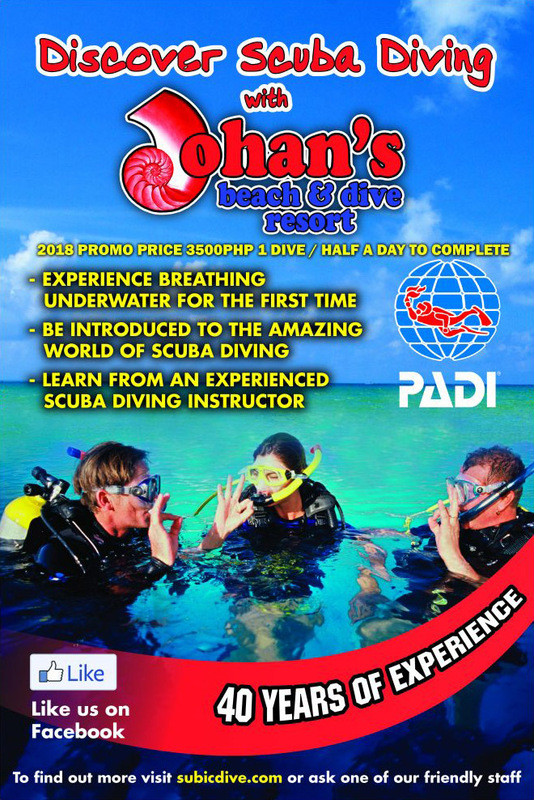 Johan’s Beach & Dive Resort also offers PADI Specialty Courses to help you develop your skill in areas that are an interest to you. You finish your course successfully and we process your licence immediately on line. You get from us your temporary licence in hand, valid for 90 days, PADI will upgrade you into there database, than send your original licence with your picture to any address you like. 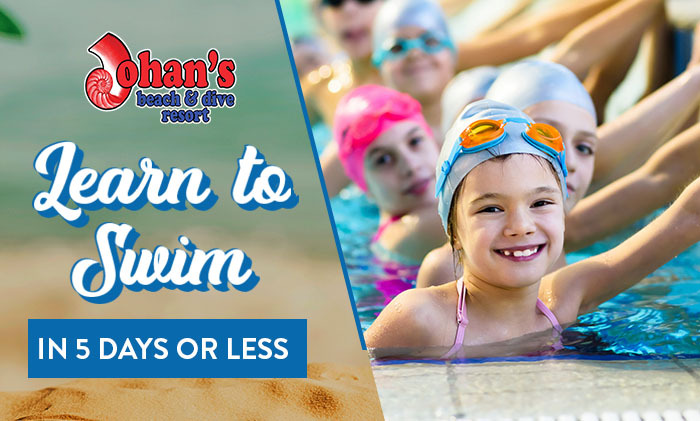 For students who do not know how to swim we offer a swim learning package of 10 sessions for P4000.00. Each session takes about 1,5 hours and you can divide these as you like, example: 5 days of 2 sessions. We teach this at any age. Minimum age 8 years, around 2 hours. 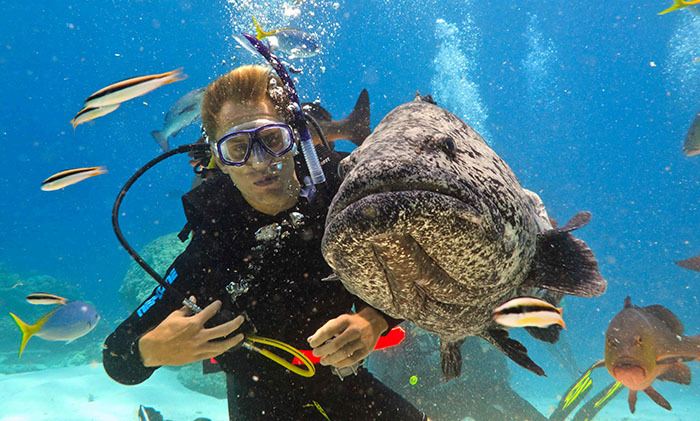 You can experience underwater adventure just by donning mask, snorkel and fins. The easiest way to see the underwater world. Short, convenient practice session, minimal equipment, lets you relax on the surface in shallow water and watch the natural beauty below. Inclusive of one snorkel trip. Free rental of equipment. P 2,500.00 plus book P 500.00. Minimum 8 years, approx. 5 hours. Here we go a few steps further than snorkeling, you will be able to make practical applications of skills that are uniquely for skin diving, like breath holding, to swim below the surface. 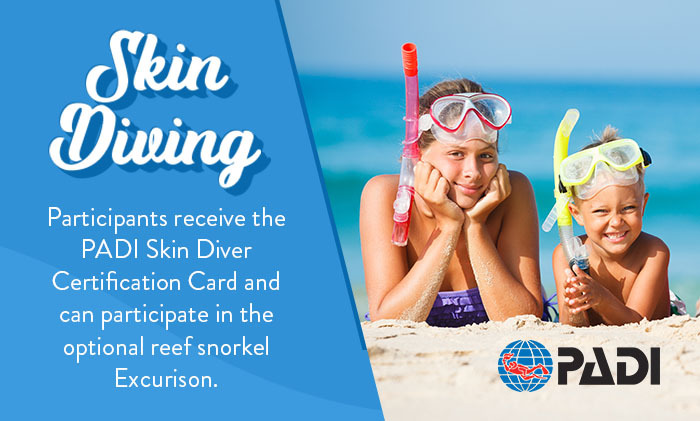 You will be able to enjoy yourself while building confidence in your skin diving ability, developing judgment and gaining a lot of experience. Php 4,000.00 plus book Php 1,000.00. Inclusive of one skin dive trip. Free rental of equipment. Minimum 10 years, around 3 hours. 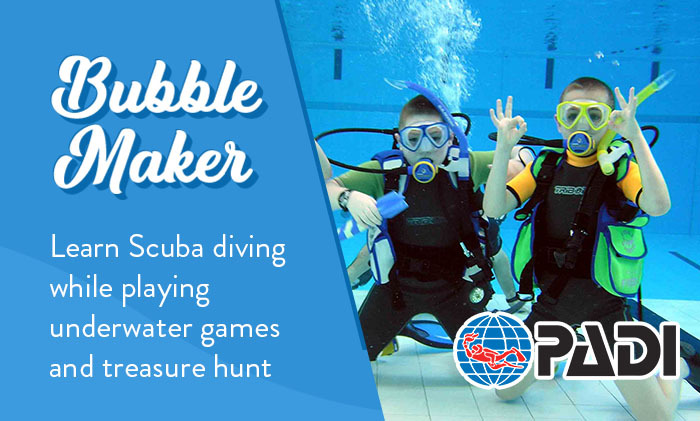 If you’ve always wanted to try scuba diving this is the chance you’ve been waiting for! 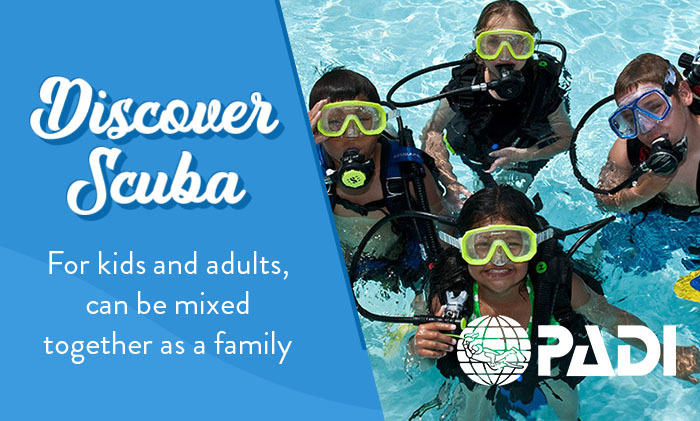 It allows you to see what it’s like to breathe underwater in a one-session scuba experience conducted by a PADI professional in the secure familiarity of a swimming pool or confined water. Quick, you can complete the experience in three hours! Free rental of equipment. 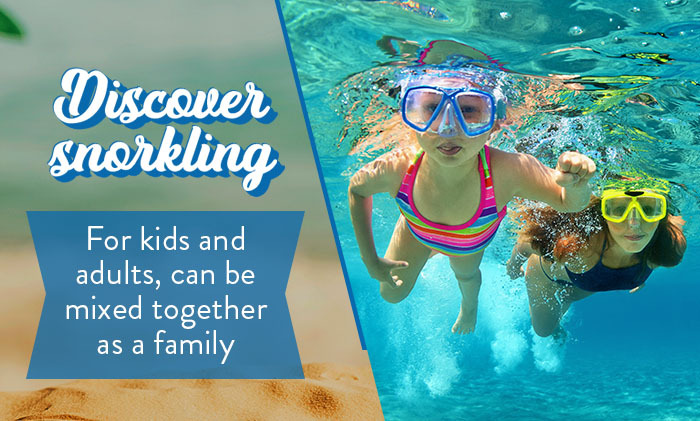 Minimum of 8 years same as Discover Scuba but for kids between 8 and 10 years. 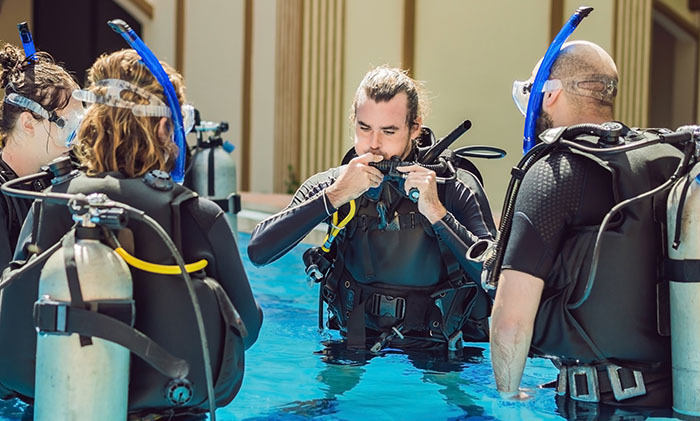 Let them get the first taste of scuba in the confines of a swimming pool at a maximum dept of two meters or six feet under the close supervision of a professional PADI Instructor. Free rental of equipment. Minimum 10 years, approx. 3 hours. You can learn this in three easy steps. First you watch an informative DVD, fill out some questions in your DSD student book, than you go true some academics and practical applications with your instructor. Second you go into shallow water of a swimming pool or confined water to practice some skills. 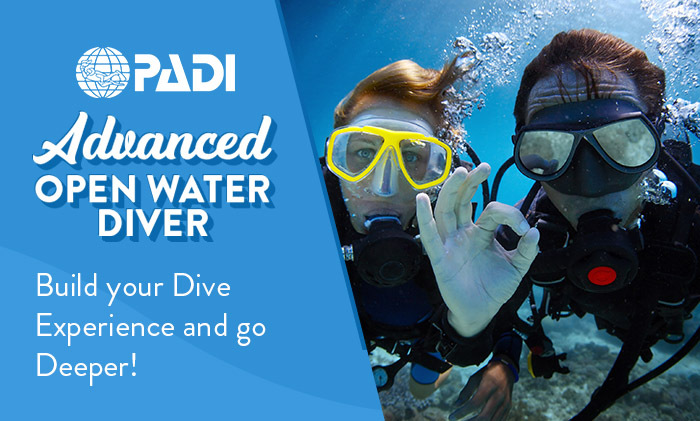 Third under the careful supervision of your PADI professional, you’ll go on an actual dive in shallow, calm water. 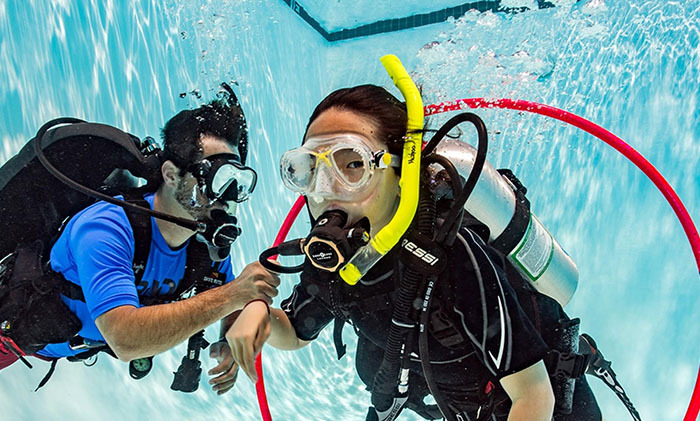 This lets you experience scuba diving without committing to an entire course. 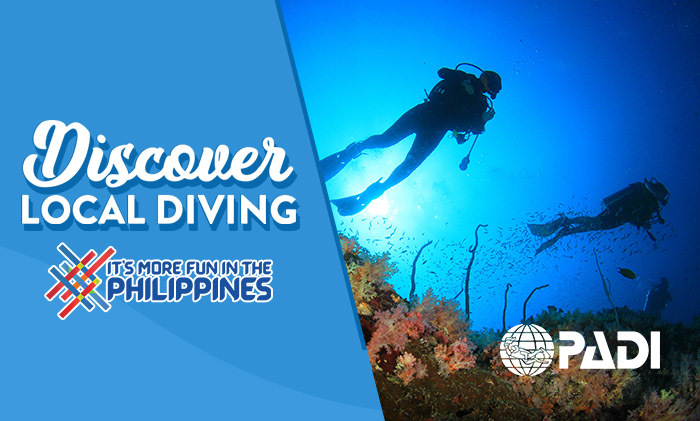 More dives can be made under the supervision of a PADI professional at P2500 each. Free rental of equipment. Minimum age of 15 years or junior scuba diver 10yrs. Approx. 20 hours of instruction in 3 days. For those with less time to finish the whole course or like to dive max 12m / 40 feet. 3 Knowledge development session, 3 pool or confined water dives & 2 open water dives. This enables you to dive under the supervision of minimal a Dive master with your worldwide accepted scuba diver certification. 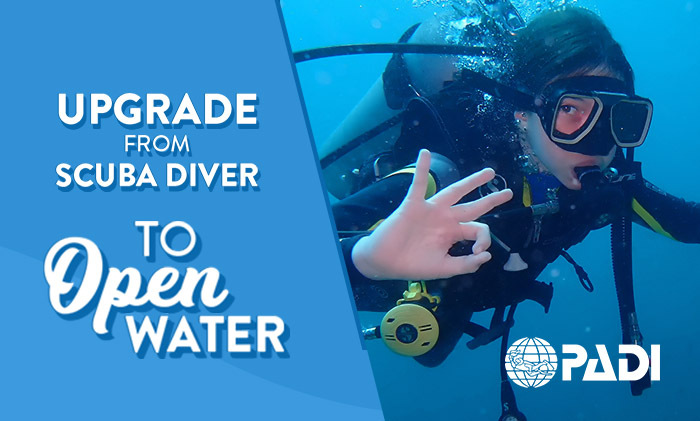 Then within 12 months you can complete the rest of the open water diver course & get your open water diver or junior scuba diver certification. Free rental of equipment. Minimum age of 15 years or Junior open water diver minimum 10 years. Approx. 30 hours of instruction or 4-5 days. 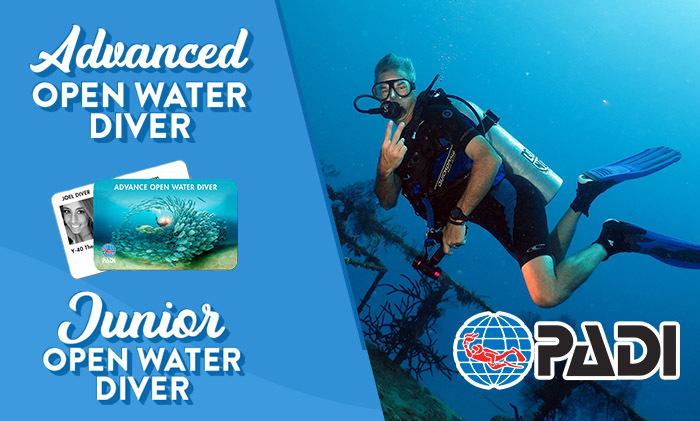 Both junior and open water diver provides you with the knowledge, skills, and experience you need to become a fully certified diver. Five knowledge development sessions, five skills development sessions in a pool or confined water and four scuba dives in open water. 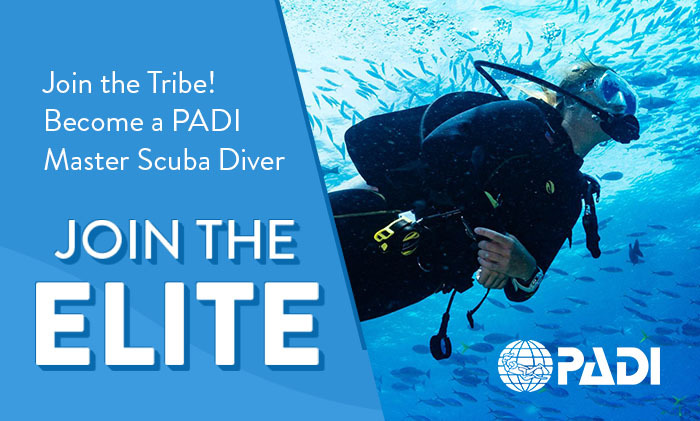 Earns the PADI worldwide open water certification, enabling you dive without direct instructor supervision all over the globe. Free rental of equipment. This is an underwater guided tour (one dive) designed to orient divers to our local conditions or reorient divers to the open water environment. Long time since you were diving? This is the way to get a complete review on your level of diving in an informative and entertaining format, academics, confined water skills and inclusive 1 guided dive. This is a new update course previously known as Scuba review or scuba tune-up, you can do this in one day. 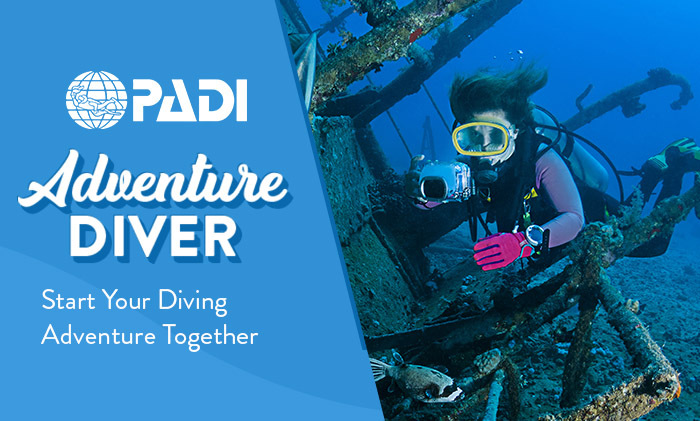 Discover new activities, gain expierience and confidence at new dive locations. This can be credited to your advanced open water course. For all adventure dives, adventure diver or advanced courses you have to buy the book only once. Minimum age of 15 years or Junior advanced open water diver minimum 10 years. 2 Core dives, deep & navigation diving & 3 adventure dives to choose from including, altitude diving, boat diving, digital underwater imaging, drift diving, dry suit diving (additional Php 500 for rental of dry suit per dive), fish identification, night diving, peak performance buoyancy, search & recovery, underwater naturalist, wreck diver. Emphasis on leaning during actual open water dives. You will complete the first dive of 5 specialties from an actual course than later you can decide if you want to take this particular course. Upon completion of the Advanced diver course you will be allowed to dive to a maximum depth of 30 meters 100 feet. Php 11,000.00 plus books packet Php 4,500.00. Adventure divers may upgrade to an advanced open water certification by 2 more elective dives at there choice, deep and navigation are core dives. 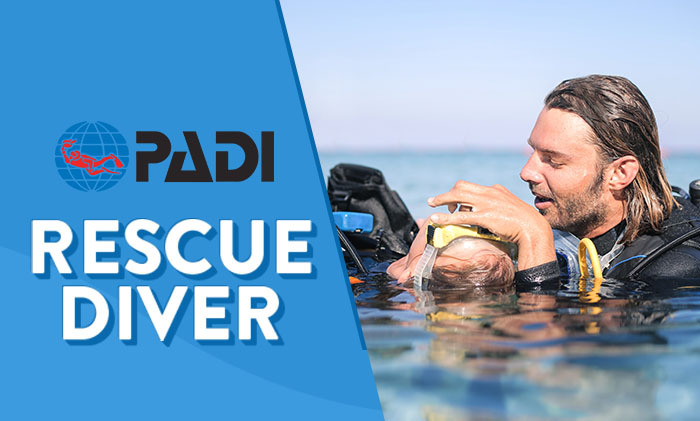 This is a unique course that provides the skills to make you a safe diver & a better dive buddy. Lot’s of water training exercises and serious fun. Any diver can do this no matter the size and shape. 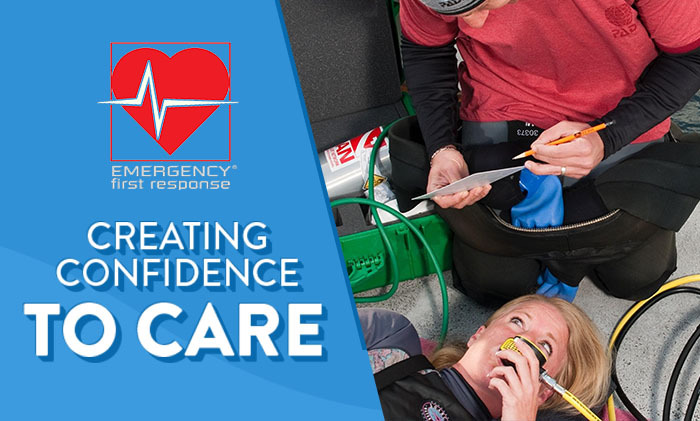 Everyone should know medic first aid, divers and non-divers. Accidents can happen everywhere, you might save the life of your loved ones. The first professional level in diving. A comprehensive program in three main phases: Waterman ship, knowledge development and practical application. Php 25,000.00 plus crew pack Php 13,000.00. Ask for dates, all done by our course director. Approx Php 35,000.00 for assistant instructor and Php 45,000.00 for instructor plus books. The PADI Master Scuba Diving rating places you in an elite group of respected divers who have earned this rating through both significant experience and scuba training. Fewer than two percent of divers ever achieve this rating. If you show this card at your dive center, people know that you spent time underwater in a variety of environments and had your share of dive adventures. 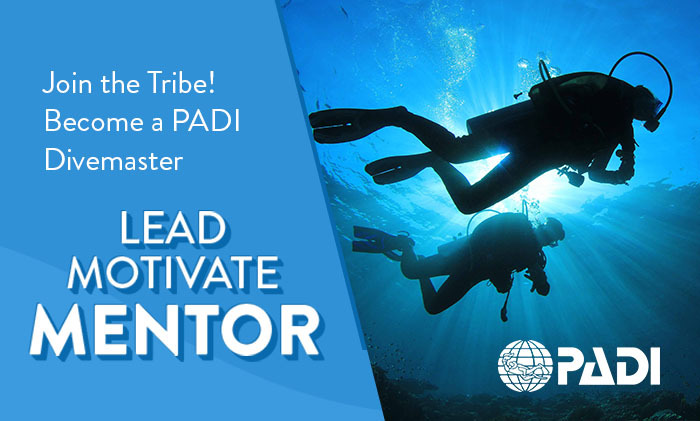 You need to be a PADI Advanced open water diver, PADI Rescue diver (or qualifying certifications). You also need to earn five PADI specialty diver certifications and have logged a minimum of 50 dives. Once you got all this and you finished all five of your specialties certifications at Johan’s we will give your Master scuba diver card for free!